It’s said that there’s no such thing as an overnight success story — certainly not when it comes to developing a product to treat thinning hair. In our case, 17 years of research on thinning hair has culminated in the launch of our Invati Advanced Solutions for Thinning Hair 3-step system. 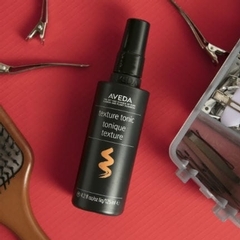 There’s much more that goes into creating an Aveda aroma than you might think. Because we use plant-derived ingredients, our perfumers have a much narrower palette to work with than conventional perfumers. At Aveda we have about 200 plant-derived aroma ingredients while a conventional perfumer has about 3,000 possibilities. We strive for functionality as well as beautiful aromas. This means that the aromas must complement the benefits of our products. For example, the aroma in our Stress-Fix™ collection has been proven to reduce the feelings of stress. “Aromas should stimulate emotions connecting with each user on a deeper level,” says Guy.